Edit: I think my Roman numerals are wrong. IIX doesn't exist, does it? Sorry. I'll leave it in its original form for your amusement. Without further ado, let the outline begin. C. Can we get out of here asap? D. Maybe we can find one like this, but closer? C. Ok, we’ll put a reservation on it. D. But maybe we should still hold out for something better? F. Perfect for me. We’ll take it! But what ever could that mean, you ask? How is it possible for today to not be today? Move to Brazil and try to rent an apartment, and you will find out that today is never today. Example: "Today we will get the keys." Turns out they actually meant 4 days from that particular today, which means on that day, today was not today. "Today we will sign the contract." 3 days later and the contract is still unsigned. Today was not today. "Today I will come to our reading session, Cris." No show. Today was not today, because then they call the next day and say "Can I come tomorrow?" But I will tell you about a day that was today. Last night, during my evening break between reading sessions, Roberto asked, in Portuguese, if I would like to accompany them to the Orchestra...today. I heard "Orchestra" and "R$5" (the US equivalent of about $3) and said "yes!" I just missed the "today" part. So when, at 7:15, I was waiting on them to pick me up at the church building to take me home, and his daughter called to ask if I needed to change out of my jeans and flip flops before we left in 20 minutes, I said "The Orchestra is TODAY??" I haven't given you a real report on how my work is going, so I thought it was about time. My reading sessions are going extremely well. I'm still trying to iron out final details of my schedule, figuring out what works best for the readers and for me, but as of right now I come for 2 sessions in the morning, then return after lunch and stay until around 8. I currently have one group class of very basic, beginner English speakers, that meets once a week, with plans to start a couple more group classes once I get to know the readers better and can form them into cohesive groups. As of right now my schedule is so full that most readers are only coming once per week, but once things settle down I hope that they will be able to come more than once each week. I have really been enjoying the church services, too. It's hard for me to understand everything and listen consistently (when it's a language you're trying to learn, listening to a 30 minute sermon can get pretty exhausting!) but I love being with everyone. Last Sunday, one of the LST readers from the summer projects was baptized! It was an exciting day for everyone. Also, one of my readers, Joao, visited for the first time. He said he enjoyed it and would like to come back. Hopefully he will! So...that's what I've been up to lately. Confusing the true meaning of today with the use of the word today, and making friends with my readers. It's a good life. Thanks for all the comments! You're doing so well! I would like to direct your attention to the comments section of my previous post. With a chance to beat her oldest sister, who just so happens to be my own mother (who just so happens to not have left a comment, despite my mention of it twice, now thrice,) my Aunt Barbara commented, requesting for the title of Favorite Aunt to be bestowed upon her as a result of her efforts as first Aunt to visit the commenting page. Then, in an act of defense, my Aunt Nell swooped in to defend the title, claiming that she had, in fact, herself, been the first aunt to comment back in the infant days of this blog (which is true,) just had forgotten to sign her name due to inexperience with Blogger, but had told me by phone that it was she who left the mystery comment (which is also true.) Not only does this make me laugh, but I would like to pose a question to the oldest of the Buchanan girls (Mom): will you stand for this? Will you be outshined by your two younger sisters? I've never known an oldest child to pass up a challenge like that. We younger siblings know this. I now will introduce to you a new feature of this blog, Buchanan Commenting Feud 2007. We have Team Oklahoma and Team Arkansas, with the obvious captains being Barbara and Nell. It is up to you to recruit your sisters (and husbands, and daughters, and father) to accrue points for your team. So far, Arkansas is winning, 2-1. Come on, Team Oklahoma. In completely unrelated news, I discovered this week that I really must be a true Brazilian. Although I have a "cara de Americana" (an American face, I keep hearing this), my Passport doesn't lie. I'm legally as Brazilian as the next guy. And this week I gained proof. 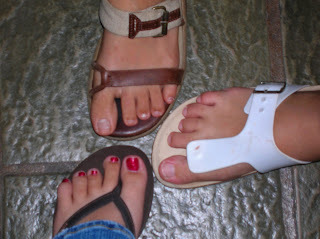 Since the 5th grade I have been teased for a strange aberration in digitary formation on my left foot. My middle toe is the exact same size, if not smaller, than his neighbor on the left. Look at your own foot right now so you can understand that this is not normal. In college, a friend affectionately dubbed the toe "Stubbs," but even still, I have never in my life known another person with this problem and source of grief. That is, until I came to Natal. It must be a Brazilian thing. Take a look: Stubbs and I are on the bottom, he is painted red. At the top is Pollyanna and to the right is Fernanda. 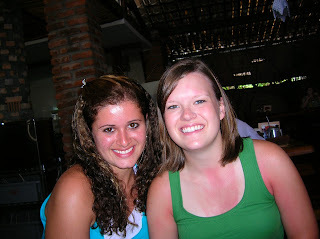 Stubbs is a triplet, and I hereby declare myself a true Brasileira. The apartment search/renting process might be coming to a close TODAY! I am fully prepared to post the Apartment Search Outline within this next few days, along with pictures of my new, furniture-less abode. But still, it will be mine, all mine!! This is a milestone for my time in Natal, and in case you can't tell, I'm just a wee bit excited about it. This week, week 3, has been great. It flew by as I was keeping busy all day every day working on logistical stuff or in my reading sessions. I made many new friends as I met my readers for the first time, and am excited about the time we will spend together over the next few months! Each day I grow to love this place and these people even more. They have taken such wonderful care of me, and have fed me well. Today was the first day I didn't eat a papaya for breakfast, because I think I finally learned that even if I don't have it today, it will still be available tomorrow. What a luxury!!! Congratulations to my 5 readers of the week, the 5 who commented on my last post in which I shamelessly asked for comments. -not my mom. She still hasn't commented. Come on, Mom. Thanks to you 5. You have boosted my confidence this week that those dots don't grow for nothing. Today marked 2 weeks since I have been in Natal. I'm still happy, still loving it, and still excited about what God holds for my future in this city. I began my reading sessions yesterday, and thus far have had six great sessions with six great people. With most of them (depending on their level of English) we didn't even get to the lesson, we just talked and got to know each other! I love meeting these people and getting to know about their lives. They range from the ages of 16 to mid-40s, and have had all kinds of interesting experiences to talk to me about. I am excited to get to know them better and to become friends! I am so fortunate to have a job that is not only significant, but FUN as well! I am excited to see what it's like to develop the LST reader-worker relationship over the course of a year, rather than the short 4 week project I experienced last year. To quote a little Gavin DeGraw, but with an entirely different meaning than what he intended in his song, "this is the start of something good, don't you agree?" I am still fundraising in order to cover unexpected costs and/or the second year of this internship, so if you find a few bucks laying around and think "my goodness, what on Earth could I do with this money?" I encourage you to click on that link over there --->. I promise you it will be put to good use. Speaking of the dots being huge, after I arrived, I noticed that the dot over Natal was getting bigger and bigger. I thought "My goodness, who in Natal is reading this?" And then it hit me..."YOU are, Cris." I guess you don't have to be the smartest person in the world to do mission work. And let's all thank God for that. I now have a cell phone, but the hunt for an apartment is still on. I have faith that God has a nice, spacious place with a balcony and ocean view out there for me. Ha! Yeah right. I mean, He could, but I have faith that God just has something and we will find it soon. If He needs for me to have an ocean view, by all means, who am I to get in the way of that? :) Although I am antsy to get settled into my own space, I really am enjoying exploring these places. Plus, I'm learning what it's like to have patience with Brazil. Yes, living here requires patience with the entire country. I will not elaborate. Just pray for our relationship. I will leave you with a photo from last night, taken after church at the most delicious little sandwich stand on a corner close to the church building. I'm certain my team ate dinner at this place at least twice a week last summer, and since being here a week and a half, we have already eaten there three times. If you come to visit, I can pretty much guarantee you at least 3 meals at this place. For like 2 dollars (including your drink.) Have a good weekend! I intend to. Although I just posted, (not that I have a posting schedule I have to follow...but I feel the need to spread it out a bit. Don't ask me why...) I feel the need to write again after today. I had another great day with the missionaries, and feel so blessed to be here. This morning I accompanied Roberto and Marisa to the Braga's house for their weekly team meeting. Although I didn't participate in the meeting, I heard bits and pieces of what they discussed and what/whom they prayed for. I have been so impressed with both of these couples simply in the way they have raised their families, but also in how they have committed their lives to serving the church in Natal. 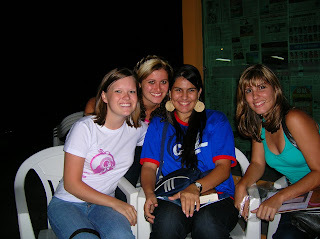 The Bragas moved to Natal last summer while my LST team was here, and so I didn't spend much time with them. I knew they were going to do a great job, but in the week I have been here I have been able to see with my own eyes what kind of difference they are making. It seems like they are in Bible studies with everyone-- new Christians, older Christians, their children, non-Christians--seriously, everyone! Each day they find a way to tell me how thankful they are that I am here and that they are here for me if I need anything. Anything, they emphasize. Hospitable is not even a sufficient word for how they have received me. They are truly godly people, and I don't even have words to explain how much they mean to me. The only picture I have of the Bragas, from last summer. Here in Natal rainy season is upon us, which actually feels quite a bit more like hurricane season. The wind is wickedly strong and howls through the tall buildings all day long, and at any second I am prepared for Marisa to shout "It's raining!" and we frantically must run around and shut all the windows... until 3 seconds later when it's not raining anymore, and we can open them again. No one ever said life in Brazil was dull. Speaking of, life in Brazil is not dull. Yesterday I had the BEST DAY and was so happy about it that I layed awake in bed until 2 am thinking about great of a day it had been. It began with Roberto's birthday lunch at one of the best restaurants around, Mangai. (Muhn-guy, not man-gay.) Mangai is a really fun, open-air restaurant that has very traditional Northeastern food. 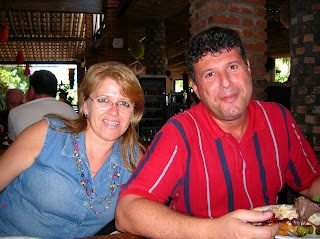 But it also has really traditional Brazilian food, which happens to be the best food on the planet. I was lucky to be included in the birthday festivities . Then we went to the church building in time for Marisa's Portuguese literacy class. She teaches a group of about 5-7 older ladies how to read and write in Portuguese. They arrive at 1:55 on the dot and happily sit at the table and cut out shapes, learn their letters, practice a bit of math, and adore Marisa for an hour. It is a precious sight. While Marisa taught class, my friend Sergio (who doubles as my personal assistant...just kidding...but kind of...) and I worked out my schedule. He filled me in on all of the new readers from this year and we drafted up a reading schedule, including times for Portuguese classes and group reading sessions. This got me so jazzed up and excited to begin working with these readers that I think I was beaming the rest of the day. Today Marisa and I are going to go and buy a book for me to begin studying Portuguese. I'm REALLY excited about this because I am antsy to not have to rely on the person whom I am having a conversation with to complete every verb I say. It would be like if you and I were talking and I said "Yesterday I was talk..." and you would say "talking..." and I would say "Yeah, yesterday I was talking to my mom and then she say..." "said" "yeah and then she said...." Annoying, eh? So all in all things are going well. I will begin reading sessions on Monday. Please be praying for my relationship with these new readers, that we are able to connect and get more out of our sessions together than just English vocabulary. :) I appreciate all of you so much and pray that you are having a good week, too. Ate logo! 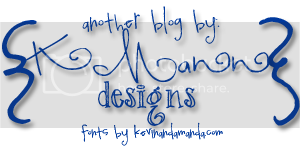 Is it okay to brag a bit on a missionary blog? No? Okay then. I won't. But I will tell you that I have been rather impressed with myself today with how much Portuguese I have spoken. It's a very strange thing, and a small phenomenon that I think I am going to enjoy watching transpire over the next weeks and months. My family left Brazil when I was six, and therefore I stopped speaking Portuguese when I was six. However, it's still in my head, and by some kind of lingual magic, it just appears out of nowhere. I'll be attempting a sentence and a word will just pop out that, I promise, I have not consciously considered before coming out of my mouth. It's just there. In the words of A Goofy Movie, strange things are happening to me. However, my grammar is terrible and I can't conjugate verbs to save my life. At least I know this, and I embrace it. My friends are taking great pleasure in teaching me, and I appreciate them so much for having patience with me. So all of that to say that I am exhausted! Constantly bouncing between two languages (in my head and in conversation) is seriously tiring. Good thing I'm loving it anyway. It is so great to be with everyone again. It took no time at all for me to be reminded of why I fell in love with this place so quickly last year and came back. I'm excited to meet the rest of the new readers from this summer and continue with their LST reading. It will probably be a week or two before I actually begin maintaining a regular schedule (lots of settling-in to do,) but I am anxious for that time to arrive. The holiday at Genipabu was less of a retreat and more of a relaxing day by the pool, very similiar to the way Americans celebrate the 4th. I had a lot of fun catching up with my friends Sergio and Pollyanna and getting to know one of the new readers, Sarah. Tomorrow will be my first Sunday since I arrived and I am excited about being with the entire congregation again. Thanks for your comments, emails, and messages. I promise I will get back to all of you soon, but please know how much they have meant to me. I have lots more to say, but I think this is enough for today. Oh, and the title of this post means "I'm trying." It's what I say every time I mess up in Portuguese. :) Estou tentando!! Question: How do you clean up a bottle of waterproof sunscreen that busts in your suitcase? Can't use wet rags. This, my friends, is why you pack things in plastic bags. At least it smells like coconut! This morning the sun woke me up at 5:30. I could already hear the hustle and bustle of the city outside and happily fell back asleep. When I got up a few hours later, the breeze was blowing through the open windows and I sat down to eat breakfast in the kitchen. (In Brazil, breakfast ties with lunch and dinner for best meal of the day. I can't choose!) As I was pouring my coffee, the Brazilian national anthem began to play from some place close by, drifting in through the open window. It felt ceremonious, like it was blessing my first meal. I laughed long and hard, then took a picture to send to my family. ...and I quite literally have no idea when I'll be back again! After 30 hours of travel divided up by 5 flights and 6 airports, I arrived in Natal, Brazil this afternoon. The weather is as warm as it was when I left OKC yesterday morning, and it's just the end of winter here! The two missionary families, Roberto and Marisa Signoretti and Osmildo and Marta Braga, with their daughter, Catherine, greeted me at the airport then let me rest for the remainder of the day. I will be staying with the Signorettis for the next few weeks while I get my bearings in Natal and begin my adjustment, then eventually will move into my own apartment. I am so happy to be here. I feel at home in Natal and love the people here so much. I can't wait to be able to share stories and photos with you of everything I will be doing over the coming weeks and months. Please keep me updated on your lives as well! It looks like I'll have pretty regular internet access, so feel free to get in touch with me at any time! Thank you all so much for your support, prayers, and encouragement. Again, none of this would have been possible without you! Please continue to keep me in your prayers. You are in mine. Sidenote: My body says it's 6:30 in the evening, my clock says it's 8:30, but I feel like I should have been asleep hours ago. So, if anything written in the paragraphs above sounds strange, chalk it up to exhaustion and I promise to be more myself next time after a few full nights of non-airplane sleep!